In order to be fully involved in the energy transition and anticipate the future needs of its customers, ENGIE relies on ENGIE Labs, its international network of research centres. In these laboratories, many projects are being brought to fruition every year, the aim being to design better quality buildings. Mariane G., Team manager - Digital transformation of energy services unit for ENGIE Lab Cylergie, tells us about the virtual building, a tool developed to perform energy simulations, and test heating system regulators in real time. What role does ENGIE Lab Cylergie play within ENGIE? M.G. : The Cylergie Research Centre has been up and running for 30 years. This laboratory is specialised in energy ser-vices jobs. It employs 20 people divided up between two centres. A «renewable energy and comfort services» centre and a «Digitisation» centre, where we currently manage all the means at our disposal to add numerical and digital technology to buildings. For four months now, agap2’s consultant Sébastien has been working on the «virtual building». What needs will this project developed by ENGIE Lab Cylergie meet? M.G. 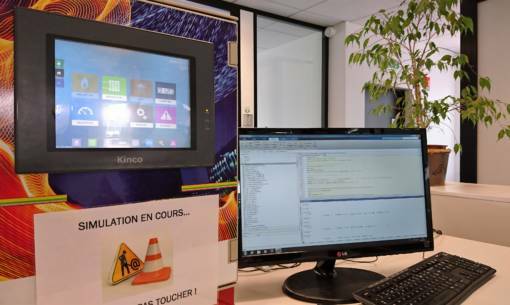 : The «virtual building» has been operational for two years and is in-creasingly in demand by start-ups in particular, seeking to sell artificial intelligence solutions to ENGIE. It’s a real modelised and connected virtual building with a real regulator used in boiler rooms, which includes an algorithm. By simulating the thermal and energy response of the building in real time, this tool enables us to test the regulator, assess its efficiency and thus identify which regulator does a better job of controlling the building. This saves a lot of time. Formerly a characterisation study could take up to one year to validate a regulator. Nowadays, the «virtual building» is capable of simulating a year’s worth of tests in just one day (accelerated time) or in two weeks in perfectly representative conditions (real time). What are the project’s future prospects? M.G. : This tool is intended to remain inside the company as it really sets us apart on the market. Upgrades are made by adding functions and deve-loping other models of buildings that allow us to carry out tests in different conditions. We are now able to alter various parameters, such as plate glass surfaces, inertia, weather data, hours of presence, geographical location, the type of building, etc., in order to be representative of most existing buildings. This is the part of the project Sébastien is involved in. Sébastien, a consultant with agap2, is helping ENGIE Lab Cylergie improve its «virtual building». Within the scope of developing a boiler room simulator devoted to training ENGIE operators, I conducted a great deal of preliminary work aimed at appropriating and reprocessing the Matlab code, which was then used to improve the virtual building. Once the code had been finalised, I was able to adapt it to the project so as to keep only the essentials functions. I subsequently added other func-tions at the request of ENGIE’s teams (boilers, thermal thermostats, etc.) to meet users’ require-ments as closely as possible. It’s their feedback that has enabled us to make headway and develop the project. We had to be fairly flexible and reactive. Decisions are made fast, and my onsite res-ponse is equally swift, and that’s what I like about this project.